When I started my project, I knew practically nothing about car restoration, mechanical details, or fiberglass repair. Oh, I knew where parts were supposed to be and what their basic jobs were, but I had never personally accomplished any of the work. But that didn’t stop me. This book is written for do-it-yourselfers, by a novice do-it-yourselfer. Enjoy! Like most of us, I had a limited budget. 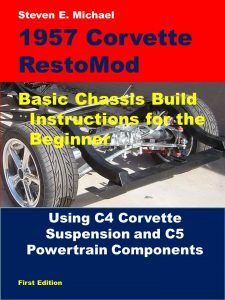 The book describes in detail how a novice can build a performance RestoMod in the garage. I show you how to build your car without the high labor costs and delays of restoration shops. This book is for the less experienced, but also appeals to the most savvy veterans of Corvette restoration. Sometimes trial and error, many times research, but mostly I used my head on this project. I made mistakes, always put safety first, and you get the benefit of both in my book. My project is unique and uses three generations of Corvette: C1, C4 and C5. If your project uses any of these eras, this book may help you. 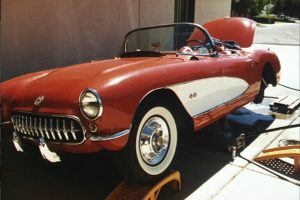 The body and trim are from the 1957 Corvette – the icon. This was the last year for single headlights and 13 teeth in the grille. It’s the year Corvette went racing, and won almost everything. My front suspension & steering are from a 1996 Corvette Grand sport. The GS was a limited edition of the Corvette and had the powerful LT4 engine, beefier sway bars, and larger brakes. The GS front-end was PERFECT for this project. This book does not talk over your head like most do-it-yourself manuals. The book describes procedures in great detail and with numerous photos. Sidebars are inserted to explain any background or warning information about the step you are working on. Photos not only illustrate the area you’re working on, but they also contain pointers to specifically identify what the text is saying. In some cases, various methods of doing a task are offered. In all cases, the safety of you and the parts is always paramount. 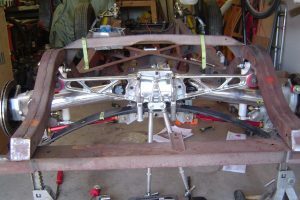 The rear axle is from a 1995 Corvette with automatic transmission, the Dana 36. It includes a limited slip differential. While I’m not building an automatic car, the Dana 36 is stout enough to handle the upgrade in power. 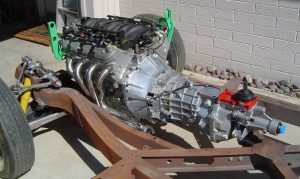 The Dana 36 was only used on C4 automatic Corvettes. You will see how I upgrade the Dana 36 with 3.54 gearing and all new seals, bearings, and cups. 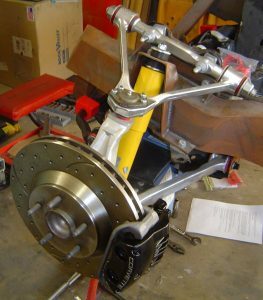 I also explain how to replace or rebuild all universal joints, bushings and rear brakes. The C4 is an excellent choice for suspension. It’s economical and still available in salvage yards. It also has outstanding handling capability. Each chapter contains a list of required and optional tools. Many instructional manuals do not, but I explain the purpose and uses for these tools. Also covered are which parts to save and which probably need replacement. All new parts are listed at the end of each chapter with part numbers, manufacturer, and a retail source. Finally, the supplies you’ll need to do many jobs are listed with potential sources.